The Chairman and Committee held the Whitewater Valley Preservation Society’s popular Autumn reception in Riseley Mill by kind permission of Mr & Mrs Tony Bushell on Sunday 2nd September 2018. John Fleming invited volunteers to check where outflows enter the River Whitewater after periods of heavy rain during the Autumn and Winter. Please contact John via our email ContactUs@WhitewaterValley.org.uk. Tom Ryder-Runton reminded members to complete and return their General Data Protection Regulations (GDPR) permission forms, in case they had not already done so. Belinda Hallam invited members to send high resolution photographs of the River Whitewater and its valley for the WVPS website. Please contact Belinda via our email ContactUs@WhitewaterValley.org.uk. The Whitewater Valley Preservation Society encourages everyone to respond to the Government’s consultation on the National Planning Policy Framework. The deadline is 10th May! Read the Whitewater Valley Preservation Society response. The Whitewater Valley Preservation Society (WVPS) has been engaged by South East Water as a consultee in the production of the last two 5-year Water Resource Management Plans. The Society has actively been involved with the Environment Agency and Natural England in the implementation of the Water Framework Directive and the production of the Loddon Catchment Management Plans. We also campaigned for the river during Catchment Abstraction Management Strategy reviews and subsequent Restoring Sustainable Abstraction programmes, which finally resulted in a decision by Natural England that South East Water could no longer assume long term abstraction from the Greywell source. The River Whitewater may look clean and beautiful but appearances can be deceptive. Clear does not necessarily mean healthy. WVPS, in conjunction with Salmon & Trout Conservation UK, selected 5 locations suitable for their Riverfly survey, from the source at Greywell to the confluence with the Blackwater at Riseley. The detailed results were analysed at a laboratory and a series of charts produced, using data collected from other chalk streams to suggest conclusions which could be drawn from those comparisons. EPT scores – Ephemeroptera (up-winged flies), Plecoptera (stoneflies) and Trichoptera (caddisflies) – should be around 20, but the highest is 13, and one location scores only 6. Annual Mayfly species should score 10 but the actual scores were 7, 5, 3, 2 and 1. Results show that most sites exhibit sediment pressure in Spring and Autumn. Phosphate issues are more pronounced in the Autumn and are at or above the line of concern at two sites (Deptford Lane Bridge and Holdshott Farm). Organic Enrichment from slurry and possibly untreated effluent is visible at all sites. Autumn results reflect the impact of lower flows concentrating the sediment and phosphate load, although the Spring results are not much better. The full WVPS 2017 Riverfly Survey final report includes a map showing sampling sites, and Appendix showing in more detail the 10 measures of ecological status used to analyse each sample. The Whitewater Valley Preservation Society has responded to a renewed public consultation on the Owen’s Farm planning application. Owen’s Farm is a proposed 700 house development West of Hook. WVPS objects based on potential negative impacts on the environment of the River Whitewater and its valley. The Society is concerned about potential impacts on biodiversity, flood risk, landscape and degrading a rural footpath. Furthermore, the Society is disappointed that Natural England has withdrawn its previous objection. The Whitewater Valley Preservation Society is concerned about potential impacts on the natural environment of a proposal to develop the Deer Park, Odiham. A renewed application has been submitted to develop the historic Deer Park (Hart planning applications reference 17/03029/FUL). The Deer Park provides open green space between Odiham, running down towards the River Whitewater as it flows through North Warnborough. WVPS has made an objection on the basis that, if permitted, this development would harm the natural environment of the River Whitewater and its valley. Particular concerns expressed by WVPS include the potential adverse impacts on Wildlife and Biodiversity, the quality of the Riverine Environment, Flood Risk and Conservation Areas around the river and its valley. Guest Speaker – Julian Seaman. If you are interested in joining our Society please do not hesitate to email ContactUs@WhitewaterValley.org.uk . 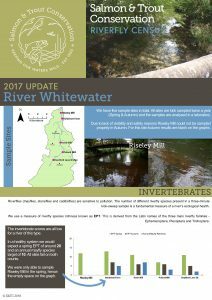 The Whitewater Valley Preservation Society has published its response to the Environment Agency’s consultation on its charges. The River Whitewater is failing to meet Good Ecological Status (GES) under the Water Framework Directive (WFD). As a direct result WVPS has raised funds to carry out a study into the Whitewater in the context of the Salmon and Trout Conservation UK’s River Fly Study. The survey was conducted at five sites along the river, in both spring and autumn. Results from the first year reveal that all sites fail on both of two indicators of a healthy system. Significant effort will be required to make improvements to the river’s ecology. The type of work likely to be required will be directly affected by the proposed increase in charges for river works. As a result, it will deter organisations such as WVPS from being able to carry out the works and thereby will effectively further damage, or at least fail to improve, the river ecology. WVPS therefore objects to the scale of the Environment Agency’s proposed increases for charges for permits to carry out habitat improvement works in our local rivers. There are many community groups, river trusts, wildlife groups and societies such as ours who, with limited funds, are currently making a real and important contribution towards improving rivers and streams and the implementation of the Water Framework Directive on failing water bodies. The work of these groups is not recognised in the assumptions behind the revised proposed charges. The proposed charges are extortionately high – far too great reasonably to expect small organisations to pay, especially for small scale community based work relying on charitable funding and volunteer labour. The charges imply that there will be financial gain from river improvement. This is simply not true for the projects, which organisations such as ours wish to undertake. The benefit is to the wider ecology, to society, and to meet Water Framework Directive objectives. This is work, which the EA itself should be undertaking or at least funding, to meet Water Framework Directive targets. The Environment Agency (EA) is currently consulting on proposals to change its permit charges. The EA proposes to increase significantly the cost of applying for Environmental Permits for, amongst other reasons, habitat improvement work in rivers. “This type of work is regularly carried out by volunteers or small organisations working on shoestring budgets. The schemes are often funded by small grants which sometimes prohibit the use of the grant to cover costs such as permit application. Even when allowable, the charges could swallow up as much as 25% of the grant. Yet the aims of these projects are typically to improve riverine habitats for fish and other wildlife, enhance diversity and to reduce flood risk. This fully supports EA policy objectives including the achievement of good qualitative and quantitative status of all water bodies under the Water Framework Directive (WFD). The projects give a valuable opportunity to engage the wider community in the planning and implementation of schemes. This could result in increased habitat degradation, reduced flood and drought resilience, all compromising the EA’s ability to meet those WFD targets. The effects of the proposed changes could have been mitigated by a much needed revision of the poorly drafted permit exemptions, but we have been advised that this is outside the scope of the consultation and not currently under consideration. Further reaction and advice for making responses is provided by The Angling Trust. We encourage as many individuals as possible to reply to the Environment Agency Consultation, which closes on January 26th. Both the Whitewater Valley Preservation Society and the LFCC will be lodging formal objections to the scale of the proposed increases. We will publish the WVPS response on our website as soon as possible. The Whitewater Valley Preservation Society has responded to the application for a major development of 700 houses in the gap between Hook and Newnham.